The SAT and ACT grammar sections want you to make the passages as clear and direct as possible. Typically, when three of the four answer options are pronouns and only one option is a specific noun, the correct answer is the specific noun. 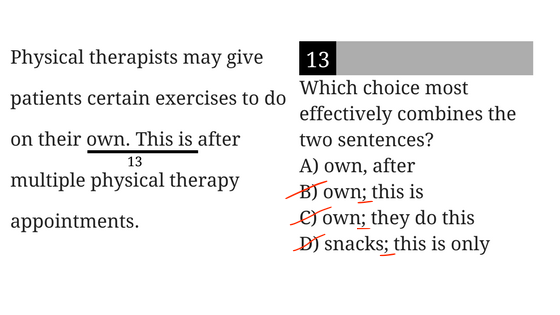 Some questions on the SAT Writing and Language section ask you to “effectively combine” two sentences. Because semicolons separate two independent clauses (complete sentences), answer options containing a semicolon do not actually combine the sentences; therefore, you can eliminate any options with a semicolon first. Then, you should check the remaining answer options for proper grammar, overall flow, and concise wording. If multiple answers are grammatically correct, select the most concise one. Short and sweet is the name of the game here. Once you’ve eliminated any answers that use improper grammar, choose the answer option that contains less “fluff” and gets right to the point. Colons can only come after an independent clause (complete sentence). Anything ending with “such as” is an incomplete sentence and therefore cannot be followed by a colon. 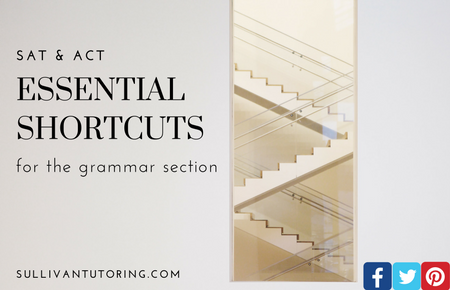 The SAT and ACT often give “such as:” as an answer choice in hopes that students will select it because it sounds good— even though it breaks punctuation rules. 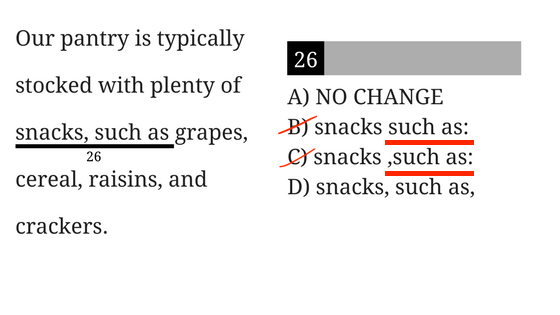 If an answer option contains the verb being or having, it is most likely incorrect. These are usually weak, passive verbs which can be avoided, so look for an answer option that contains a similar message without utilizing these verb forms. It’s is the contraction of it and is. Its is the possessive form. Its’ is a non-existent form and should therefore be eliminated anytime it is listed as an answer option. Many people select its’ because it looks “fancy” and unique even though it is not a functioning form of it.